Please Note: This post was originally posted in 2014, so while most of the links still work, we cannot guarantee it anymore. However, we have updated and released a new Top Ten Christmas Gifts list for 2018, which you can visit by clicking here. Do you hear those sleigh bells ring-a-ling, jing-jing-jing-a-ling too? No? Maybe it’s because bells don’t actually sound like that, or maybe it’s because you’re too busy watching the hockey game instead. Fantastic! But you still probably have to go out and buy some presents, or at least figure out the list you’re going to give to your significant others/parents/friends for all the thing you do want. And so of those are most-likely hockey-related. So, here at HbD, we’re putting together a list of strange, or wonderful, or obscure, or geeky, hockey-related gifts you might be wanting for yourself, or might be perfect for the hockey-loving people on your gift list. These aren’t actually ranked in any specific order, but our selection was somewhat based on weirder being better. And when we couldn’t find weird, we threw in some cool ones. Everyone wants a chance to drive the Zamboni machine! This scaled down version of the Zamboni ice resurfacer is a perfect little companion for your desktop. 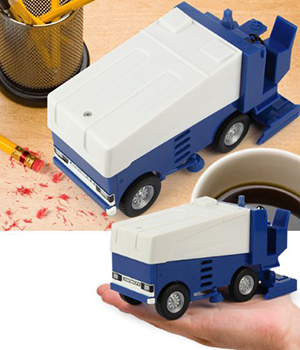 Recreated as a desk vacuum, this Zamboni machine will help tidy your work space. Fear not the desktop dust and crumbs, for the Zamboni desk vacuum is ready to resurface in your “arena”. Christmas is fun and giving gifts is fun, but what if when you buy gifts of others, you’re helping the less fortunate? Even better, right? Especially if you or your loved ones keep having problems with your pants falling down and you need a belt. A dollar from every Mission Belt sold goes to fight global hunger and poverty through Kiva, a non-profit peer-t0-peer micro-lending organization that helps provide opportunities to support economic development and entrepreneurship. Every dollar goes 100% to the end borrowers. Fantastic! And you can get it bright Red Wings red. Or Sharks teal! 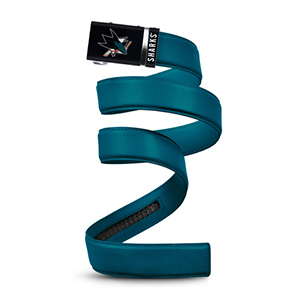 Get them at Mission Belt Co.
Get yours at the NHL Shop. Goalies are strange folk. Philosophizers, emotional nutcases, tire-pumpers. And we love them, so why not show them that love with some products from Brown Hockey? Nothing obscure, bizarre or weird about these gifts. Just high quality goalie equipment. 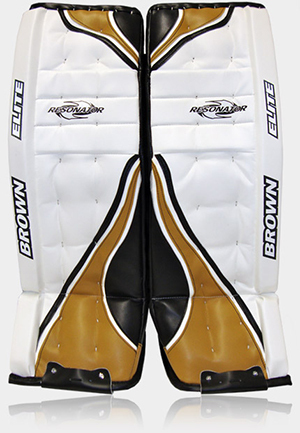 From our friends at Brown Hockey: “Brown goalie equipment is made in Canada and has been since 1970. There is no substitute for the quality of Brown handcrafted equipment. We are goalies too and we understand how important it is that your equipment fits properly. We design and manufacture equipment that is made to wear. Each goalie is unique and we offer custom sizing for all products at no extra charge. You deserve a proper fit and top-notch protection.” If you’re looking for the best goalie equipment in Canada or beyond, you’ve found it. Visit them here. Like the Bruins? If so, you’ve now found that t-shirt you’ve always wanted. 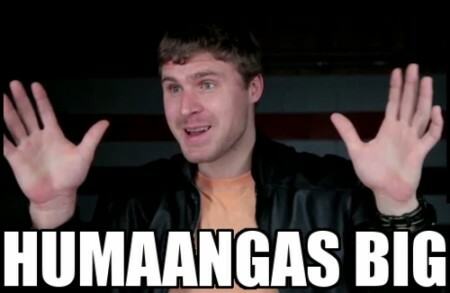 Hate the Bruins? Keep moving to #5. Beast From The Northeast creates some fantastic sports-specific t-shirt designs out there, regardless of team or city, so they deserve a bit of a plug. They have shirts for all the major Boston sports teams (Patriots, Celtics and Red Sox t-shirts are in there too) and they’re constantly coming up with clever and exciting designs. From Tuukka, to St. Bergeron, to Södaclops, BFTN has you covered. So, come on in, the soup’s on! You can visit them here. 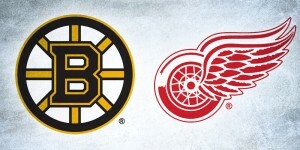 If you hate the Bruins, you’re probably a Leafs or Habs fan, so here’s something just for you. If you hate the Bruins, Habs and Leafs, you must be a Canucks fan. But chances are, you know someone who loves the Habs or Leafs. Those kinds of people are everywhere. 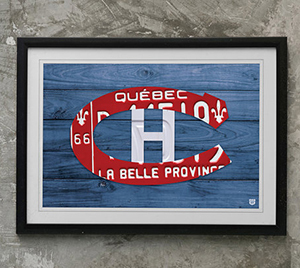 The people at Route 401 – an online Etsy store – have created some pretty cool Leafs and Habs gifts that are essentially the team logos, but with a twist. They’re unique license plate art handmade from vintage, recycled license plates from around the world. Wow your friends with these one-of-a-kind art pieces. Custom designs available! Custom designs? 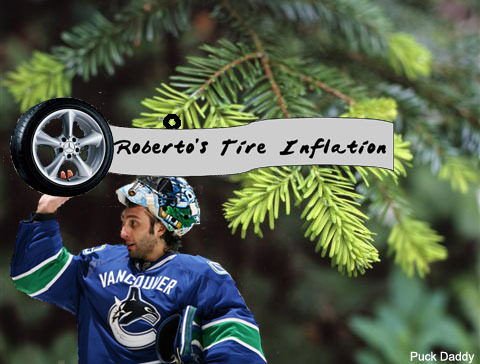 Maybe Canucks fans can get their fix here after all. It may be too late to get them for Christmas, but if you let people know what’s on its way, they’d probably be willing to wait an extra week or two. Visit the online store here. It’s time to get geeky, in a fantastic way. 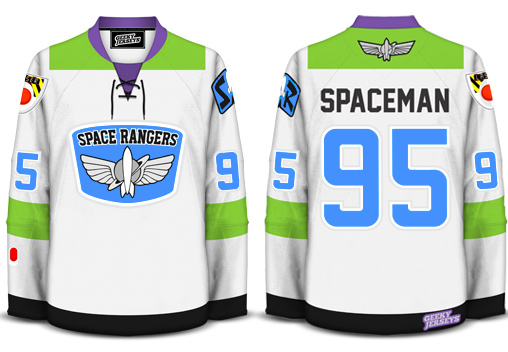 Dave at Dave’s Geeky Hockey mixes hockey with pop culture, creating hockey jerseys for teams that will never exist. What’s available keeps changing, but there have been Ghostbusters jerseys, Game of Thrones jerseys, Transformers jerseys, Toy Story jerseys, James Bond jerseys and it goes on and on. And they’re almost always awesome. 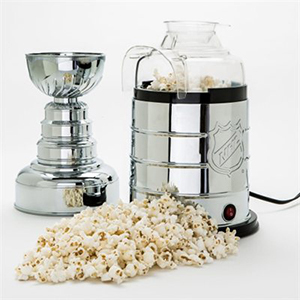 It’s a treat for any hockey fan who – for some reason – also enjoys non-hockey things, like movies and toys and stuff. Seriously, these people exist apparently. 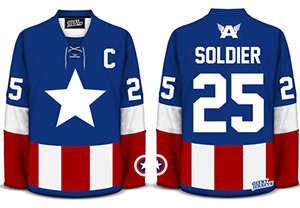 To see what’s currently available for purchase (including the Captain America jersey pictured here), visit his site. Speaking of geekdom, you probably played with Lego as a kid, and like every kid, you loved it. 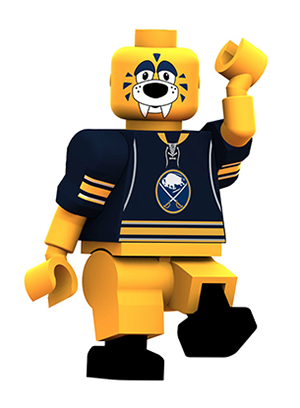 And some of you still love it, but you just wish that there was some way that you could connect that love of Lego with your love of hockey. 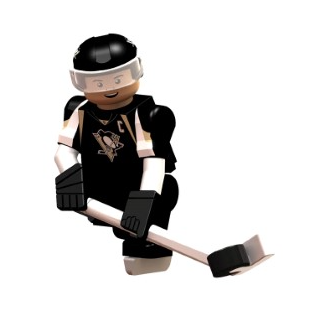 And you wonder what Sidney Crosby, or Steven Stamkos, would look like as a Lego figure. You’ve found your site. OYO Sports doesn’t make Lego figures exactly, but they’re definitely Lego-esque. 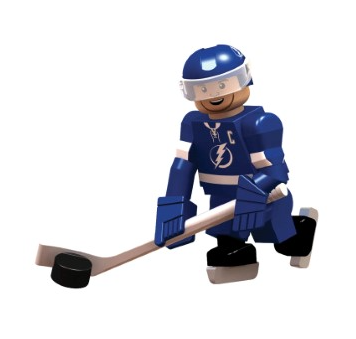 And it’s not just the real life characteristics and traits of the athletes they portray that make these minifigures special, as each OYO has bendable knees, rotating forearms, and the ability to hold a hockey stick. While these changes make our product different from Lego, OYO minifigures are the same size as other brands and are compatible with Lego surfaces. In short, OYO’s are built to play. Awesome! What adult kid wouldn’t love these? Get yours on their site. Yes, the product name is a mouthful, but that’s not the mouthful you should be worrying about. There’s beer coming down that dispenser that’s you’ll soon be getting a mouthful of. So, channel your inner Frank-the-Tank and be the life of your next house party with your goalie-mask-beer-thing. 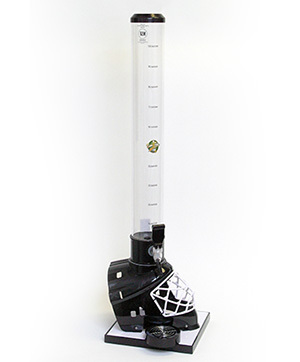 The Black Hockey Mask Beer Tube dispenser includes: Black Hockey Goalie Mask base, 100 oz. beverage tube with black plastic lid, and standard tap. Additional options for the product include an upgraded Commercial Tap and 128-oz. Super Tube. Get yours at the Beer Tube online store. What’s at #1? A onesie of course. Watch the game, drinking from your goalie-mask-beer-thing, in the comfort of your favourite team’s uniforms in a fuzzy, soft and cuddly form. That these things exist is hilarious. 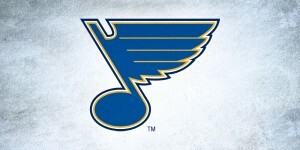 That they’re officially licensed by the NHL and the NHL teams is even better. 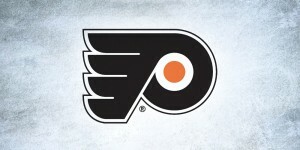 I’d love to be on the wall in the NHL merchandising offices when this came across their desk. But that’s not all Hockey Sockey sells. Their namesake is actually a hockey sock that’s converted into a reversible touque. Which you can also get with a knitted playoff beard. Strange and wonderful. 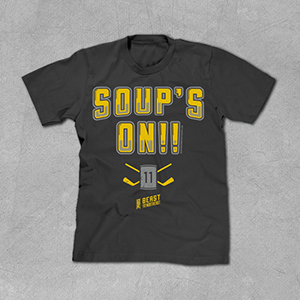 Get them at the Hockey Sockey Store. Okay, one more. Don’t forget that we here at Hockey By Design have a store of some awesome posters for you to share with your hockey-loving friends and family. There’s the Vintage series, featuring old logos/jerseys from some of your favourite teams. There’s the Play-By-Play series, which feature play-by-play calls of some of the most iconic and memorable goals in hockey history. And of course, there’s our free(!) Visual History of the NHL infographic, chronicling every single major professional team that ever played in North America, from 1901 to the present day. And remember, it’s always free shipping when you spend over $50! Visit our store here. 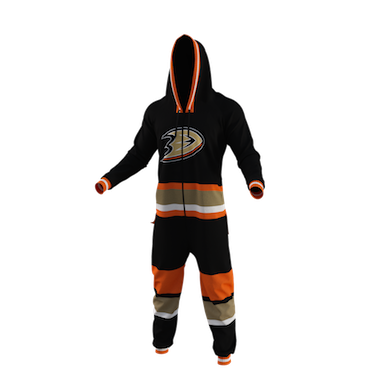 Something else weird and wonderful you want to share (specific to hockey gifts I mean)? Put it in the comments below, and share the hockey gifting love this holiday season. Hello admin do you need unlimited articles for your site ? 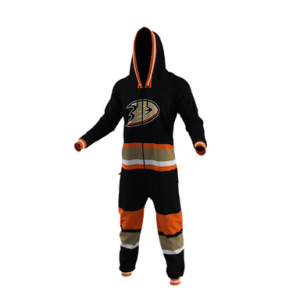 What’s up,I check your new stuff named “Top 10 Christmas Gifts for Hockey Fans | Hockey By Design” like every week.Your humoristic style is awesome, keep up the good work! And you can look our website about love spell.